You made it to the point of pollen coming into your trap. You have moved it to its final location and now it is time to transfer the frames from the trap into a hive body. This should be done on a good bee day when the work force is out flying. The more they are working the better the transfer will go. A tool to cut comb from the ceiling of the box if the bees have hung any from it. This can be as simple as a piece of framing wire or a guitar string. I usually use a section of framing wire that is 22-24 inches long with a key ring on each end. I use this tool in Hiving Trap 11 (from last year). A hive tool or two. Gather everything that will be needed prior to starting. You want to complete this task as quickly as possible without the interruption of 20 trips back and forth to your vehicle or garage. I have learned this from experience. Get your smoker lit and ready to go. One of the hive bodys or an extra hive stand should be placed in front of your trap. Remove the screws holding the lid on. NOW take a deep breath remember that no matter what happens you are going to keep calm and collected especially if you are a new beekeeper. I have had several mishaps while hiving trapped swarms. All of them were as a result of comb being affixed to the lid. Having a large section of comb covered with bees break free and fall to the ground can get your rattled. To prevent such a calamity, use a hive tool to pry loose the lid at both of the back corners. VERY GENTLY lift the back of the lid up and look to see if there are combs connected to the underside. 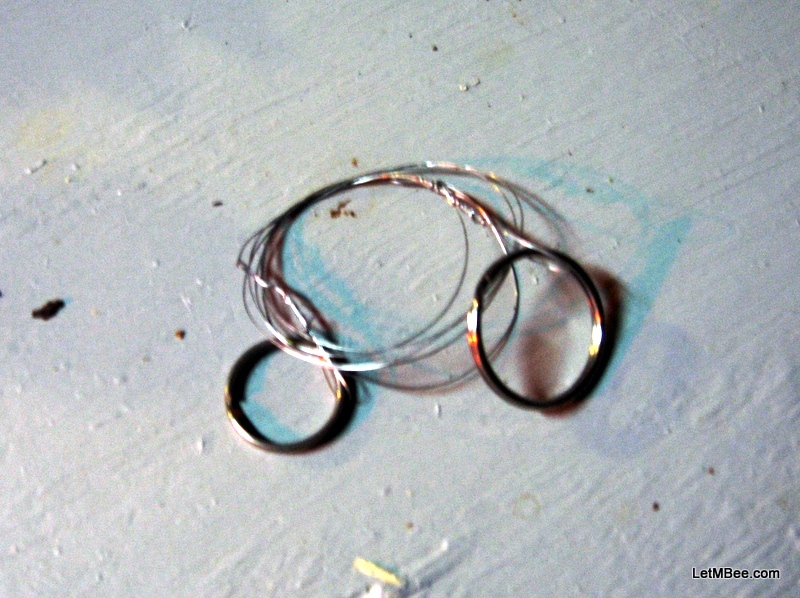 2 key-rings + 1 piece of framing wire = 1 comb slicing tool. If comb is connected to the roof of the trap lower the lid back down. Pick up your wire slicing tool and get it started on the front side of the trap between the underside of the lid and the top of the trap. Then gently pull it backwards slicing the comb and allowing it to fall ON THE INSIDE of the box. You will deal with it at the end of the transfer. If comb is NOT on the underside of the lid you are ready to roll. Remove the lid. Pick up the Trap and transfer it to the hive stand or extra deep you placed out front. Place your bottom board directly in the spot you removed the trap from. This way the foraging bees will find their home right where they left it. Place an empty deep hive body on top of the bottom board. Quickly survey how many frames the bees have drawn in the trap. If they are working on more than six or seven you may want to fill the first deep with frames and place another (empty) deep on top of it. Yes we are going to place the bees on top of an empty deep. You are just going to have to trust me on this the first time. Especially if you are using foundation-less frames you will be happy you did. I have not used this method with foundation, but I think it will give results superior to top supering. If you are skeptical try it once then get back with me after a month or two. Use smoke during this process, but as little as possible. Make sure that the deep you are transferring the trap contents to has no frames in it even if your trap contains fewer than 10 frames. Now carefully remove each frame from the trap and transfer it to the empty box. Try to look at each frame quickly to see if you find sealed or unsealed brood. Don’t manipulate them too much, particularly if you are using foundationless frames. Remember this is a newly formed colony. For one the comb is new and fragile and won’t tolerate much abuse. Also there aren’t a lot of bees in there and you don’t want any of that brood getting too cold. I am concerned about this most on very small colonies. Try to maintain the order of the combs as well as their orientation. Try to move quickly and smoothly transferring all of the frames from the trap to the hive body. If the trap contains fewer frames than what the hive body will hold, place the trap contents in the center. Now look inside the trap. If you had to slice any comb from the lid GENTLY pick it up. Most likely it will be fairly small. Normally these outside combs are filled with nectar. Gently brush the bees off of it and place on your hive lid or some other flat surface. Use rubber bands to attach the piece of comb to one of your extra frames. View Inserting a comb into a Langstroth Frame. Fill in the extra space on each side (for example the 1 and 10 position) with empty frames. Once that is completed again look on the inside of the trap. I usually try to dump the remaining bees from the trap on top of the frames of the hive body. Then move the empty trap a short distance away (10-12 yards). Within about a half an hour most of the bees should leave the empty trap. This may take longer if you had to cut a piece of comb loses from the lid spilling nectar on the inside of the trap. Close your hive up and you are ready to let them build for a couple of weeks. Check the hive for level both side to side and front to back especially if you are using foundationless frames. Shim if needed. Now you can get that trap loaded back up and hung. You have a good chance of filling it up again if early enough in the swarm season. This entry was posted in Feral Bees, HowTo, Posts, Swarm Trapping and tagged bait hive, bee, beekeeping, feral bees, Indiana beekepeing, Jason Bruns, LGO, swarm trap, swarm trapping. Bookmark the permalink. Like I said before, full disclosure…. Disclosed the fact here that I have not been keeping the grass trimmed very well around my hives. I normally mulch around everything…. Just haven’t had time. Those bees are doing great! Impressive. It’s awesome to see all those foundationless frames together. I can’t wait to try this. Also, I’m glad to see I’m not the only one who uses two hive tools during my inspections. 🙂 Thanks again for sharing all your trapping knowledge. I would be lost with just one hive tool. It appears from your blog that you go gloveless. I have not made it to that level of comfor yet. I said I was going to do it this spring, but just can’t yet. Especially with gloves on, there are times when using the two tools in tandem makes fine frame movements easier. Try it out on a small gentle colony a few times and see how you like it. I prefer not using them. I probably will get stung more than most, but the stings are usually mild and always my fault. If I get stung several times I sometimes put gloves on (if smoking the sting doesn’t work) so the bees don’t smell the pheromone and become alarmed, but that’s it. It is harder to do on a very populous colony because there are so many bees and you need to move slowly and/or use smoke to not get stung. I also got interested in swarmtrapping this season. You’re doing a gread job here! Hope i’ll have a lot of traps up soon. Thank you! Good luck with your trapping. I hived 3 more traps today. Each time I do it I learn something new. If you have any questions along the way feel free to leave it in a comment thread or e-mail me. I saw on your site you were making some plumb wine. I made 50 gallons three years ago… That stuff did NOT last long. I have been making wine longer than I have been doing bees. It is also a very rewarding hobby. I am sitting here sipping on a little Cherry-2010 right now. A glass or two before bed has become a nightly ritual. I am interested in your comb cutting tool. I will have to put one together as the knife wasn’t very good. We learned that once we hived a swarm to fill the box with frames, even empty, or follower boards because the girls will build comb hanging from an empty space. Love coming back to all this knowledge you are sharing! I’ve gone up to the Sierras twice in the last week to forage for morels, so glad to find you’ve been doing lots of writing. I tried several methods. I still would like to think of a better way of dealing with it, just haven’t thought of it yet. It is always better to get them out of the trap before they stick comb to the roof of the trap. I am envious of you if you are finding morels. This year was the worst one I can remember for finding them in our area. In the spring we take many family trips through the woods hunting for those things.